How many times a day do you look in the mirror? It’s something that most of us take for granted. Yet it wasn’t that long ago that this common home decor item wasn’t quite so common. The Lighting Corner in Jenison specializes in indoor lighting, including bathroom light fixtures, outdoor lighting, including patio lights, and home accents, including mirrors. Below, we’ll offer up tips on how to use mirrors to accent your indoor lighting. Contact us today for all your home design and decor needs! 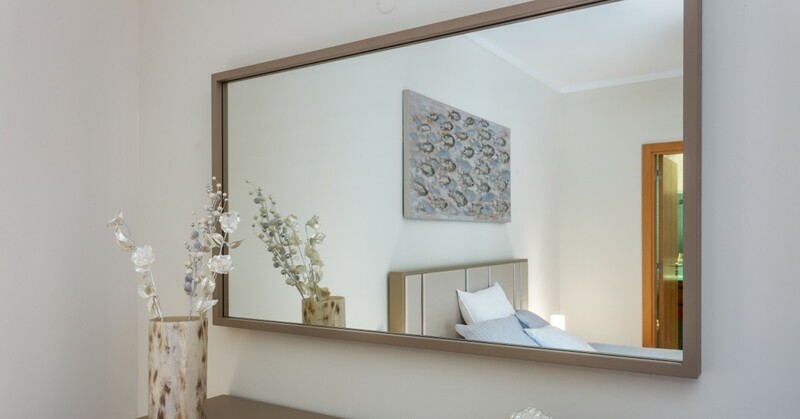 Modern mirrors have been around for almost 200 years, having been invented in Germany when a layer of metallic silver was applied to a clear pane of glass. However, mirrors have been around for millenia before with scientists suspecting the mirror was first made out of obsidian (a type of volcanic rock that is naturally shiny) 8000 years ago in what is now modern-day Turkey. The need to see our own reflection appears to have been universal, as mirrors of various types have been found in all major cultures around the world, from Mesopotamia and Egypt to China, India and Central and South America. However, nature (as usual) beat humans to the invention of the mirror with humans’ reflection in bodies of water. Reflection of artificial light. Mirrors are not only great to have in your indoor spaces as objects on their own, but they reflect light,which trick the eye into thinking your room is brighter and lighter. In order to do this, place mirrors near a light source and not directly in front of it, you may be blinded by it. Hang mirrors beneath wall scones or beneath a chandelier for maximum benefit. Reflection of natural light. Mirrors are great reflectors of natural light as well. Hang these on the wall adjacent to the window or across from it. Another cool illusion trick is to hang a mirror directly across from a window in a small room. This tricks your eye into thinking there is another window there, which brightens the room and makes it feel more spacious. Mirrors on other furniture items. Mirrors as backsplashes to other furniture items reflect light and enlarge your space as well. Try lining the back of your bookshelf or wardrobe with mirrors, or prop up a mirrored tray on your mantle for not only a cool accent item but an item that will add light as well. The Lighting Corner in Jenison offers mirrors of all shapes, sizes, and styles as home accent pieces that create ambiance and add light to your indoor space. We also offer mirrors with lights for your perfect bathroom lighting solution when you need to see up close. We offer a wide range of home accents for your home, such as clocks, bookends, prints, and candle holders. Unsure which indoor lighting or home accents suit your tastes? Visit our lighting showrooms in Grandville and Grand Haven where you’re sure to find all types of indoor lighting and outdoor lighting options. Our designer lighting experts are here to help. Contact The Lighting Corner for all your lighting solutions today!